The Hero Two Doors Down - Reading is my ESCAPE from Reality! I read this book to the students in my Sunshine State Club. 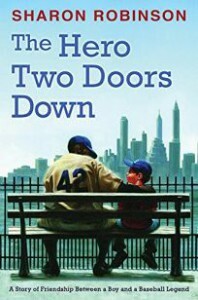 It's the story of a boy (Stephen) living two doors down from his hero, Jackie Robinson in Brooklyn in the year 1948. The book was written by Sharon Robinson (Jackie's daughter) and is based on "the true story of a friendship between a boy and a baseball legend." The kids loved the book and it was fun to discuss what it was like to live in the 1940's. It's hard for them to imagine life without a cell phone, let alone life where you can only hear baseball on the radio, instead of watching on tv. We learned about Jackie Robinson and his courage and integrity. We learned about egg creams, transistor radios, and stoopball. And we learned about what it was like to live in a Jewish neighborhood in Brooklyn in 1948. It was also fun to talk to the kids about who their heroes are and what it would feel like to be friends with them. This book is great for elementary students, especially sports fans.